Cristina Tufiño and Alex Santana. Morir Soñando. Curated by Alex Santana. Knockdown Center, New York, June 22 – August 19, 2018. © Andrew Kaplan. Alex Santana is a young Latinx curator, art historian, and art scholar on the rise. Her impressive career has included stints at El Museo Del Barrio, Mana Contemporary, and currently at Alexander Gray Associates. 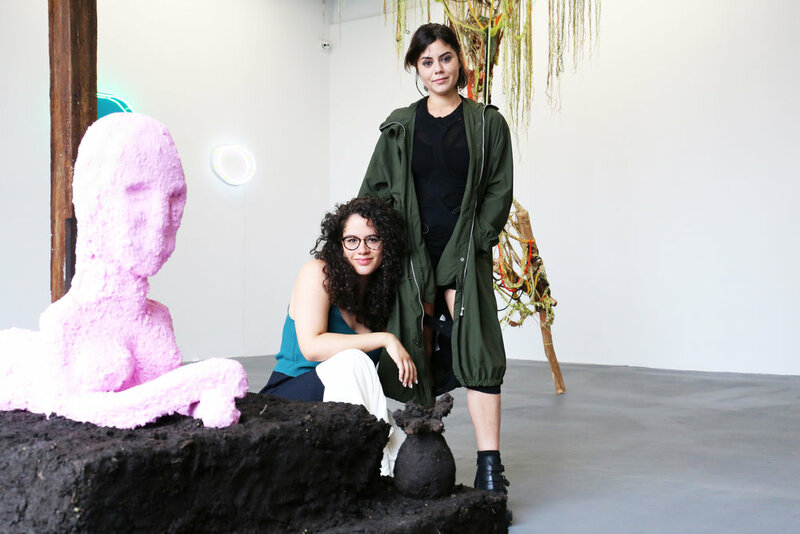 I speak with the Newark native about her debut curatorial project, the group show Morir Soñando at the Knockdown Center, which includes some faves like Cristina Tufiño, Hein Koh, and many others. Gallery Gurls: You're a young Latinx curator of Dominican descent, so the title Morir Soñando feels so organic. How did the concept for Morir Soñando come about? Alex Santana: I've been thinking a lot recently about the kinds of familial lessons we are taught throughout our lives. I'm learning now that these histories can inform our creative practices just as much as the art history survey courses we may have taken throughout higher education. Sometimes, learning how to make morir soñandos, how to change a tire, how to scavenge at the flea market—these are alternative modes of understanding our own identities as well as the varied cultural backgrounds of our families’ diasporas. My father, who is Dominican, would make us morir soñandos when I was a child. I remember observing the rhythm with which he mixed the ingredients: precise yet seemingly improvised in its syncopation. I used that imagery to construct a curatorial framework about a soft, delicate attention to process. There are so many artists who are applying a similar care to their practices, even beyond the Dominican diaspora. "There are so many artists who are applying a similar care to their practices, even beyond the Dominican diaspora." Installation view. Morir Soñando. Curated by Alex Santana. Knockdown Center, New York, June 22 – August 19, 2018. © Andrew Kaplan. Not all of the artists in the show are Latinx, which I thought was inclusive and key. Can you expand? I truly believe all the artists in the show fit the curatorial theme––this extended metaphor of the morir soñando as a proxy for delicate attention and care. This idea of expansiveness is something I'm borrowing from postmodern understandings of the Caribbean––specifically. Édouard Glissant and Antonio Benítez-Rojo––who outline a Caribbean framework that is inherently global, continuously expanding, perhaps limitless. Although some might find these texts dated, I think they have a contemporary resonance, offering ways to conceptualize the increasingly networked, global diaspora of today. Lately I've also been thinking about how the Caribbean informs all of New York City, how artists have been influenced by this cultural microcosm and how it might affect their work. I feel like Morir Soñando also speaks to a duality, whether you're a bicultural, first-generation American, who is the child of immigrants, or a person from somewhere else who is long-living in the U.S. Either way it's a constant balancing of identities. Could you speak more to this? The drink morir soñando combines disparate ingredients, much like the banal “melting pot” metaphor meant to symbolize the U.S. as a harmonious mix of identities (which we of course know is highly untrue), so I like your interpretation! It also makes me think of how Miriam Jiménez Román and Juan Flores conceptualize Triple Consciousness as an extension of W.E.B. DuBois' Double Consciousness, expanding on how identity is fractured depending on context. They were explicitly referring to Afro-Latinidad, and the ways in which being racialized in the U.S. affects your positionality as an immigrant. We’re still living in a context where things have to be explained and justified. There’s always going to have to be some kind of balance or reckoning for people who hold certain identities, and there is pain that comes with that, but also liberation, joy and growth. "Latinx artists are so often shortchanged because they are frequently placed within groupings of Latin American artists, and I think this is a lazy disservice." How do you want to bring U.S. Latinx artists to the forefront? This is something really important to me––addressing historical exclusion and all of its manifestations in this particular field we work in. U.S. Latinx artists are so often shortchanged because they are frequently placed within groupings of Latin American artists, and I think this is a lazy disservice. Doing so ignores specific particularities and circumstances. Contemporary Latinx artists are grappling with what it means when diasporic identities are politicized by an increasingly dystopian and polarized society. I'm at the stage where I'm trying to learn as much as possible. I spend hours each day looking at artists' work, consuming as much as I can, hypothesizing and imagining potential connections between artists' work that might offer audiences a broader understanding of their lived realities and common experiences. What's next for you? Do you envision more curatorial projects down the line? I certainly hope so! Right now I'm thinking about a phenomenon that seems particular to many Latinx artists I meet, although I’d argue it could be more expansive to include US artists who are children and grandchildren of immigrants more broadly. I think in a lot of cases, there's this very painful degree of ideological distance that makes artists want to re-learn their cultural heritage(s). I don't know if its a nostalgia for an imagined "homeland" or perhaps just an insatiable curiosity made appealing because of the internet, but it seems as though US Latinx artists in particular are grappling with belonging, and undergoing these very tender personal searches, in a lot of cases digitally. "Contemporary Latinx artists are grappling with what it means when diasporic identities are politicized by an increasingly dystopian and polarized society." Morir Soñando will be on view through August 19th, 2018 at the Knockdown Center.